You may start to notice that Halloween is getting a big more colorful this year thanks to the Teal Pumpkin Project. Teal is actually the official color of food allergy awareness and since it seems like everyone has some kind of a food allergy, especially kids, Halloween can be a scary time of year…and not for the good reasons. The point is this, if you paint one of your pumpkins teal blue and place it on your front stairs you’re letting trick-or-treaters know that you’ll be providing them with allergy friendly “treats.” So they don’t have to worry about things with peanuts, wheat, soy, milk, chocolate, etc, etc. They’ll still get to enjoy the fun of Halloween without having to feel like they can’t go out with the rest of the kids. I love this. Growing up my sister was deathly allergic to peanuts and my parents had to go through all of her candy and toss most of it out. 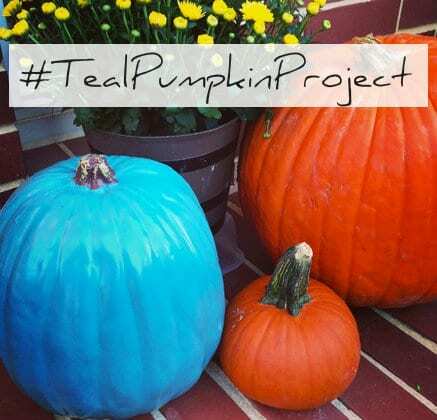 I can raise my hand for “lactose” allergies so I think #TealPumpkinProject is a genius idea that can help make everyone feel included on what should be a great night out.